My mom gave me this recipe one day. She said she used to make it because it was easy and tasted yummy. It is a quick dinner for my husband and I to have on a weeknight. The leftovers are perfect for lunch too. Thanks for the great recipe Mom!!! Brown ground beef. Add taco seasoning and water and simmer until thick. Place crescent rolls in an 8 or 9 inch pie pan to create the crust. Sprinkle with crushed fritos. Spread taco meat over the chips. Layer the chilies on the meat. Spread sour cream over top next. 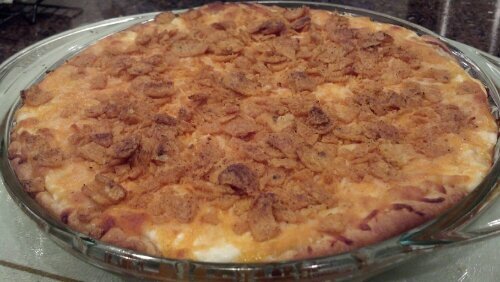 Cover everything with cheese and sprinkle more crushed Fritos on top. Bake 20 to 25 minutes and enjoy!